A new study published in the journal Proceedings of the National Academy of Sciences looked at 33 healthy Dutch soldiers deployed to Afghanistan for four months. It was the first military deployment for all of them, part of a NATO peacekeeping operation. 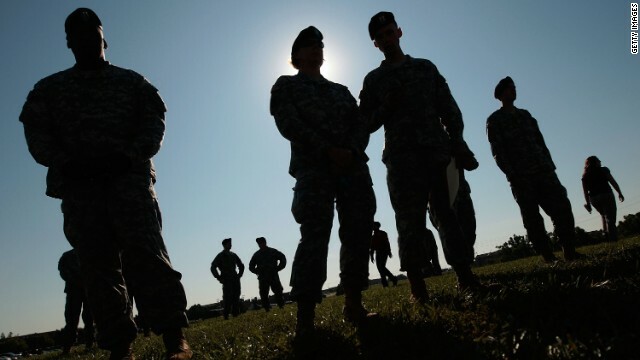 Researchers compared these participants to 26 soldiers who were never deployed. The soldiers who were deployed experienced armed combat and exposure to enemy fire, as well as other common combat stressors. But this did not appear to aggravate stress symptoms; researchers did not find significant differences in post-traumatic stress disorder, anxiety and mood scores between the deployed and non-deployed groups. But despite no apparent trends in psychological symptoms, the two groups of participants did display marked brain differences. The combat group showed reduced functioning in the midbrain, as well as structural differences in that area. These soldiers who had gone to Afghanistan tended to perform worse on cognitive tests than those who were not deployed. Those effects were seen less than two months after the soldiers returned from combat. But a year and a half later, researchers found that the soldiers who had been deployed had, on average, returned to normal with respect to both brain structure and cognitive performance. The combat group still showed some brain impairment: Imaging tests showed that there was less connectivity between particular brain regions among these soldiers than those who had not been deployed. "Although there are some subtle changes, it doesn't really directly translate into impaired performance," said Guido van Wingen of the Brain Imaging Center in Amsterdam, who was the lead author of the study. Although cognitive performance may suffer, a different brain function may be enhanced in soldiers with recent combat experience: vigilance. Previous research from van Wingen's group shows that the amygdala, a part of the brain important for detecting potential danger, has heightened activity in soldiers who have returned recently from combat. That effect also normalizes over time. The sample size of the study began small, and got smaller over time. Nine people from the combat group and nine people from the non-deployed group did not complete the long-term follow-up. Also, this study deals only with people from the Netherlands. The research is too preliminary to make recommendations, van Wingen said. But it makes sense that soldiers would benefit from time to recuperate in between deployments, so that the brain can re-adapt to a non-combat situation, he said. "What the results collectively show is the brain is able to restore (itself) from the adverse effects of stress, if you give it at least enough time," van Wingen said. As a lay person, I have no credentials on which to support my hypothesis. i wonder, however, if anyone in the field of neurology is investigating long-term exposure to stress as the cause of, rather than just an aggravation to multiple sclerosis. This article is another disparate clue linking physical changes in the brain to stress. anecdotally, all the MS patients with whom I've spoken have indicated high stress in early life either externally or self inflicted. Anyone know of any study being conducted? I don't know of a study with multiple sclerosis but multiple sclerosis is an autoimmune disorder and I do know of studies with other autoimmune disorders that have tied them directly to psychological stress. Stress has been repeatedly shown to exacerbate MS symptoms, but too date no consensus on wether it is the direct cause has been established. Dr. Ackerman, Dr. McEwan, Dr. Brown and Dr. Mohr are the big names involved in stress and MS research to date. Some interesting animal studies, but clinical studies are hard since it's hard to predict who will develop MS or not and would take years and years to do such a widespread, all encompassing trial to study. Additionally, Dr. Dhabhar and Dr. McEwan, have provided countless studies to support that acute stress can be an immunoenhancing, whereas chronic stress can be immunpsuppressing. This alteration on the immune system by the stress and disease may play a hand at the frequency, and maybe the cause of MS. But no conclusive results to date that I have found. so in these case what should people do to stop stress? i'll tell you what stresses me out.. working for people who use authority to cover up incompetence. Steve? THE Steve Martin? If so, wow. I agree with Steve Martin. Have been looking on PNAS and can't find this article, could you provide the whole reference? (not just a hyperlink that may become outdated). It appears to me that short term moderate stress would improve one's coping skills. Your first time under enemy fire, your first public speech, even your first date tend to bring on a degree of stress, but as events are repeated, anxiety and stress seem to lesson as the mind brings coping mechanisms into play! This study is much too limited to really say much of anything about resiliency. There is no disputing the fact that the brain does repair itself like any other organ in the body, given the unobstructed opportunity to do so. What could not be controlled for in this study was the situation most trauma victims find themselves in: ongoing stress due to misperception of their environment. Especially where children are concerned, once traumatized, their perception of what is happening to them is forever colored by the initial traumatizing event, and so their stress reaction becomes chronic and their brains are never given the space to recover. The vigilance noted in the study becomes hyper vigilance over time, an over-reaction to normal, everyday occurrences. When those children become adults, the pattern only continues throughout their lives. One would hope that appropriate intervention soon after the initial trauma would mediate the pattern, but how that actually plays out is difficult to measure, and an unfortunately small number of victim ever get the timely help that is needed. this is a very good comment and so true. but not just in children, also in adults. did they do the test after multiple deployments? also, just trying to get any kind of services with this type illness is setting yourself up for more trauma from the mental health, health, educational, legal, judicial, and political systems cuz they lead the masses and they sure as heck don't know what their doing, cuz if they did people like duke would make no money for their research of ptsd on veterans. vets – your real enemy is this. because the researchers would lose money if they actually did understand this or any other illness to provide the right understanding for a cure and for health for the patient as well as the patients family, the society and world in general, everyone stays ignorant, the harm multiplies, the stress from the abuse, exploitation for research purposes, or political purposes as the case often is, discrimination, prejudice, cops who have ptsd beating people with ptsd up, etc., is devastating to the whole society, and is becoming the scourge of the earth in terms of the amount of damage that can be done. What if the president with his finger on the button gets mentally ill, or has ptsd, like bush did and the same ignorance prevails, all in the name of money for a few. there will only be a few left if any, and i assure you they too will develop ptsd when they view their destruction – or not. who are these people (re: individuals) who deem to have the power to destroy so many? why would the masses follow? and when they do not, you can bet your last dollar that the ptsd will become rampid cptsd and the whole thing will worsen and continue. of course, it behooves the ones with money to keep the ones without ignorant and part of the game ... so why be their quini pig or their puppet? ms. obama demands diet drinks in schools, yet the artificial sweetners, owned by bush and co., actually cause brain damage and lead to mania, psychosis, and dieabeties. this is so bush and co. can stay wealthy and remain the choosen few to destroy the masses. if cnn would actually report the realities of what is going on, instead of being wanna be bush and co., which i'm wondering is also obama and whatshisnames true companies, than, we the masses would not have so many health issues and problems and traumas that lead to ptsd and cptsd from the ignorance, and the puppetry to the few with the money to destroy the masses – so that they can continue to feed into the few with the money with overpriced, unneeded nor wanted, and many times coerced through fear tactics medicine, health, and mental health practices. the industry is designed to thrive on sick people, so everyone will be required to be sick, its your patriotic duty (sic). "We all know stress is bad for you, but just how bad?" Awful, awful, awful. Stress is not "bad", it produces different brain patterns than not being stressed but that doesn't make it "bad". In fact stress is very important for learning. Without the stress-induced changes in the brain to facilitate learning we would all be as uneducated as the author of this article. We agree with Steve Martin and add ignorance to incompetence. And being allowed to live a peaceful existence with some ongoing creative endeavor of ones choice is helpful. a. romney gives full explanation as to why it seriously looks like the towers were blown up from the bottom with massive explosive in the movie "zeigest" (or similar) currently available at places like netflix, which shows the towers in detail, and TRULY look like they are being blown up from the bottom, as well as attacked by airplanes at the top – was that to make sure the top fell with the bottom, or only done for cover up? b. obama needs to address the issues raised in "what would they do without us" also currently available at places like netflix and how he plans to deal with justice the answers given by romeney in a. above. until than, noone should vote. it could be a massive protest, just everyone refuse to vote until these questions are answered. if everyone refused to vote until the real questions are answered about the 911 bombings – the truly look like bombings and airplane attacks – it would be a very real, very easy, and very nonviolent show of patriotism against terrorism – everyones patriotic and best interest for everyone mode of solitarity and support to the mission of nonviolence, nonterrorism, and hope for the USA and for the world. seriously, if you have read my messages, i hope you consider this carefully when and if you do vote. i can still vividly remember bush trying to hide his smirk and nonconcern as he read to the elementary school class – i was so shocked to see it – i will never forget – cuz i was also watching the bombing at the same time – and it truly was terrifying. bush said he did it to keep the children from being upset – and then spent the rest of his presidency fearmongering, and killing millions of innocent children, etc. what does romney have to say about this? obama? we the people need these answers in order to vote so as to not subject ourselves to further harm from ptsd. how do you form a massive nonvote protest? the movie Omen III or Damien ... who is the man with 666 on his scull in the movie. he is attracted to a female reporter. (there are always sequels to sequels). the only 'dagger' one has to stop the evil is to not vote until the evil is made apparent ... only then can a person truly vote responsibly. Demand answers as payment for your vote. the only chance of seeing this happen would be in our imaginative dreams and hopes for what many thought or wish USA was or could be. Great to see Steve Martin concerned about stressors and our brains. Now, whenever I feel stressed, and I mean like a deep sort of brain throbbing stress like when you go to the DMV or any of those places where a government employee is making a career out of selling you a decal that you need just to move about freely, I will think about Steve Martin jogging in one of those new (service specific) high school track suits and chasing Dane Cook, who he tases every time Dane Coke stops running. That so relaxes my mind. I am wondering if President Obama and his wife actually meant to poison the entire public school population of America with artificial sweetners to create more sick people for the people (re: duke and co. and bush and co. and pharma and co.) to make money off of as the sole reason for this decision. Why not more recess and actual instruction with consideration for physical/mental health like is seen in cultures whom practice healing exercise methods like chi gong, tai chi, yoga, meditation. I think this is where USA will lose the most, the exploitation of Americans in the health industry for the benefit of the few, not for health purposes. And the neglect of true mind/body health for the children and for the public in general. Any veering to this path other than what is truly healthy will immediately be viewed by many as a sign that the rest of the administration is also corrupt, non-logical, non-beneficial, and therefore will reject it. Speaking from experience watching kids suffer through the exploitation, neglect, abuse, and outright disablement, prejudice, discrimination, cradle to jail culture it has created and will now be asked to maintain with what I see happening to what medicaid kids suffer through already, and the people who exploit them for their own benefit like duke and co. and pharma and co. as guini pigs and puppets, I would definitely vote No to that type abuse and manipulation from the government and co.
Makes you wonder why you even have to choose the lesser of two evils in the first place. i imagine you wouldn't want to actually start wwiii at your acceptance speech, but then again i haven't listened to romney's acceptance speech yet. just wish he mentioned something about changing the unhealthy quality of our health care system, fda corruption, and corruption and exploitation within the current medicaid/medicare systems and promise to end the delusion politics on that front, which is ruining the health of the nation. so in your statement that you guess you wouldn't really imagine that anyone would actually start wwiii in their acceptance speech, and your delusionisrelative moniker, were you really referring to a "you could feel it coming" analogy? it's like if you can see the paths that lie ahead of you through intelligence, knowledge, or intuition, whilst you deal with deluded perceptions of the environmental persons or society around you – who are deluded because they don't see the paths or the outcomes, consequences, or fate before them due to their own clouded or blocked perceptions of true reality as it really is in all its multiple layers of perceptions, than you become the deluded to them while they are the deluded to you, until the future is reality and your delusion is acknowledged as insight (or evil given the perceptions of delusions that abound). And if you try to change the future for yourself and others, unless you can somehow convince them of your vision, they will view you as more that just deluded in a negative sense that can and often does (in the environment as it is) result in harm to the visionary, and more future within the others delusions. you are right about the delusion is relative referral of course, as you state, in all its various forms of delusions, and struggles to maintain and/or struggle with and/or create as reality in differing degrees vs. the same motivating factor of all others, in their varying degrees. This research was small and focussed on the stress of major trauma, battle or disasters: the study outcome/findings can not be applied to the common, usual, civilian stress that we experience daily or periodically. Recently, I did not give a lot of consideration to leaving comments on weblog page posts and also have positioned remarks even a lot much less. Aw, this was a unbelievably very good short article. Having the year and serious exertion in the direction of crank out a very good report… yet what can I say… I be reluctant a complete whole lot and put on’t afford toward get hold of some thing finished.